For users of the Application Builder, COMSOL Multiphysics® version 5.4 brings custom Settings windows and dialog boxes in the Model Builder, command line arguments, and form editor updates. Read about all of the Application Builder updates in detail below. Application Builder forms can now be used in the Model Builder, by creating a Settings Form or showing them as dialog boxes. 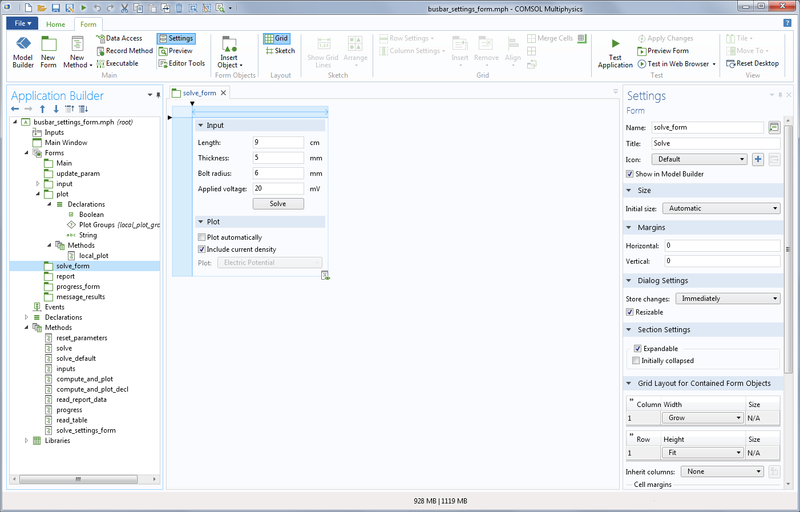 This allows you to create your own Settings windows or dialog boxes in the Model Builder that can perform complex operations on your model, using your own custom-made user interface. You can create multiple instances of your forms as Settings Forms in the same model, allowing you to use independent settings for each node. This is possible thanks to new functionality to create methods and declarations local to forms, in addition to the existing global versions. These can also be used for apps to make the app more structured and easier to maintain. To use this functionality, go to the Application Builder and select Show in Model Builder in the checkbox in the form's Settings window. Then, the forms are accessible in the Developer tab of the Model Builder. A Settings Form in the Model Builder (the form can be seen in the next image). Settings Forms and dialog boxes are added from the new Forms section of the Developer ribbon tab. 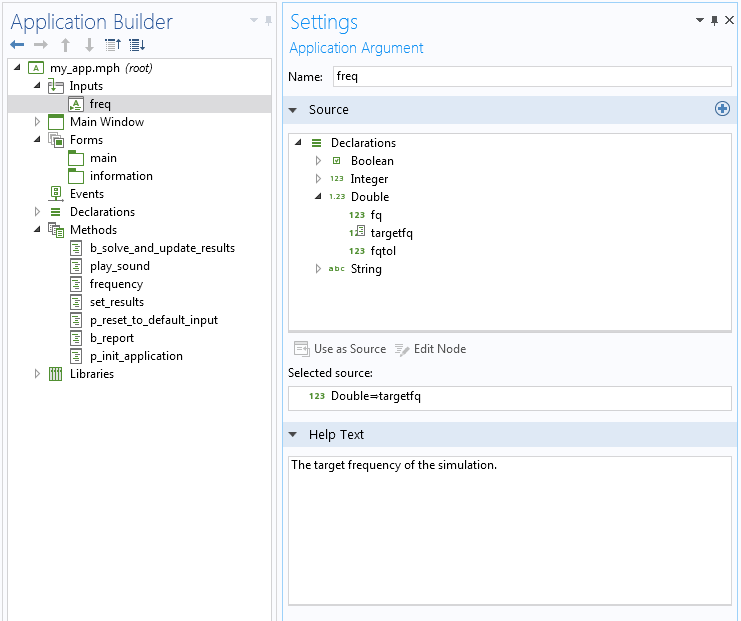 The solve_form used to create the settings form in the previous image, which uses form declarations as the source for its form objects, seen in the Application Builder tree on the left. for an app that has an input argument freq that takes a numeric value 400 (a double, in this case). The target frequency supplied as input to a compiled version of the app. 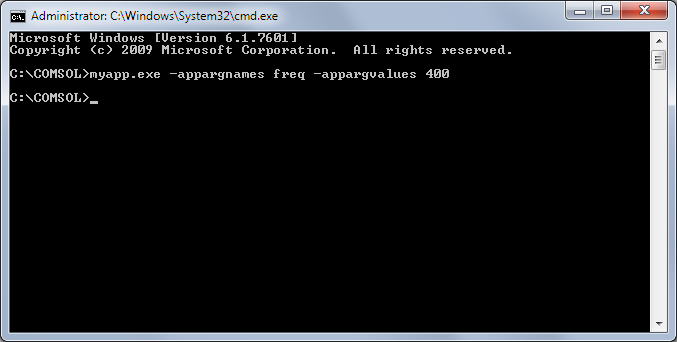 The target frequency supplied as input to a compiled version of the app. There are a number of improvements to various form objects. 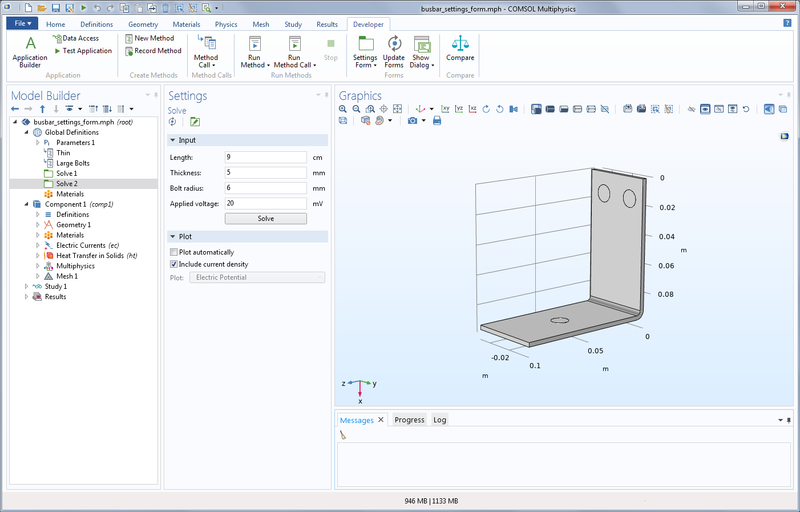 Material colors, as well as the new selection colors (see COMSOL Desktop®), can be displayed in the graphics form object. For buttons, there is a new "Flat" style as well as support for setting the background color (not supported on the Linux® operating system and macOS). There is also an option to center the application on your screen at startup. The Tuning Fork app using flat buttons. The Tuning Fork app using flat buttons.